A woman's body is prone to iron & calcium deficiency which lead to serious health hazards later. Iron deficiency, especially after child birth, complicates lot of things. Failing to compensate the low levels may lead to hair fall, brittle nails, fatigue, paleness in skin and much more. Anemic women face trouble in keeping energy levels intact which adversely effects their social, economic status. Why wait for the consequence to take a toll when little changes in food habits can do the job? 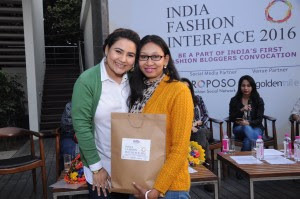 In association with livogen.in, here is an attempt to create iron rich recipes for women and help fight anemia. I love having poha for breakfast and keep giving twists to it for interesting recipes. 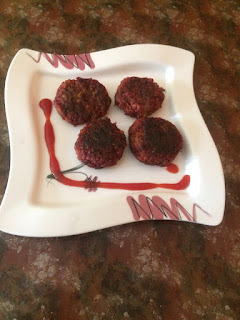 Hereby, presenting tikki or cutlets made with poha, beetroot and potatoes. Beaten rice or rice flakes, also called poha is a rich source of iron. Every 100 grams of raw rice flakes has 20 milligrams of iron besides a good value of carbs and minerals. Experts suggest that regular consumption of flattened rice can prevent iron deficiency and form hemoglobin that carries oxygen to blood cells. Beetroots are also iron rich and proven extremely beneficial in case of anemia or low hemoglobin..
Soak poha in water for 10 minutes. Drain water. Keep aside. Make sure all water is drained out from poha. Peel and grate beetroot. Keep aside. 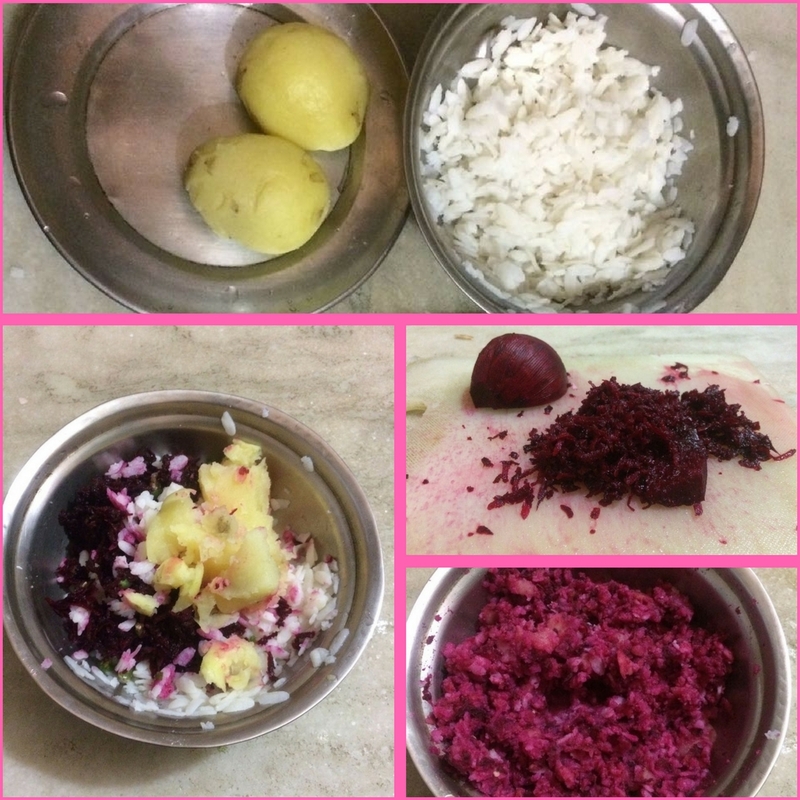 In a large bowl mix the mashed potatoes, soaked poha and grated beetroot. Bind them together to make dough. Add salt as per taste. Mix black pepper and coriander powder. Churn the dough well. Make little round shapes from the dough, pressing them gently to flatten them. In a pan, heat oil and shallow fry the cutlets. 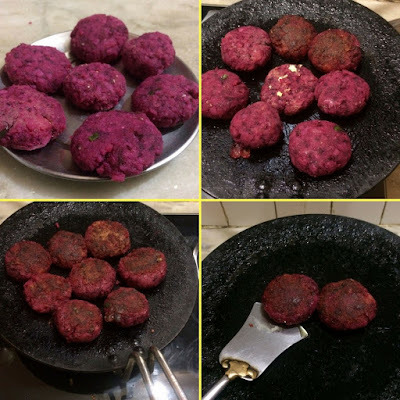 Flip and fry till the pink tikkis turn brownish on both sides. Tip: Flame should be kept low to medium. Potatoes give cutlets a binding texture and body. Do not over-boil potatoes. Since beetroot is used raw in the dough, it will give crunchiness to cutlet. 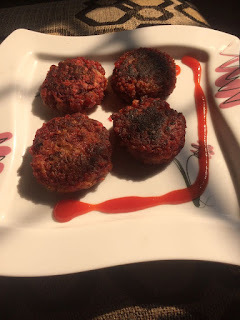 You can add onions to the tikkis if you like. I wanted to keep it quick and simple, hence skipped it. Come winter and the market gets flooded with green veggies. 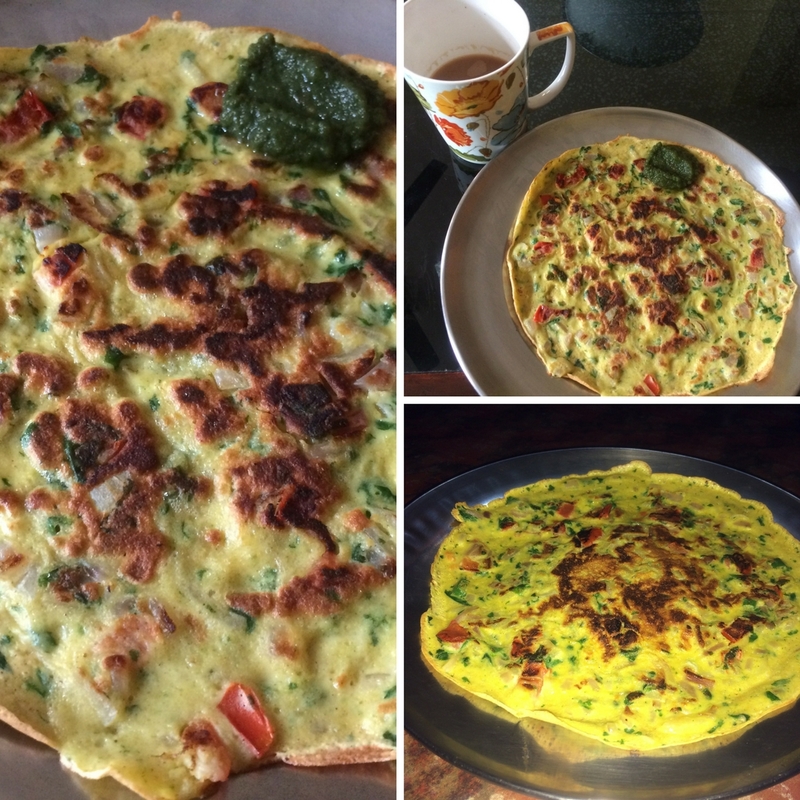 Spinach suddenly rules the Indian kitchens. But who really wants to eat palak saag or palak paneer every day? So, I put on my thinking cap and dished out chickpea spinach & egg spread for a winter morning. Keeping the fact in mind that iron is one of the most important elements for women's body, Livogen.in's iron chef inspires me to make an innovative recipe fortified with iron. 100 g of besan or gram flour contains 34 iron, 68% dietary fiber and good amount of vitamins. Spinach is undoubtedly a rich source of iron, magnesium, dietary fiber and zinc while egg stands out with iron, protein and Vitamin D.
Blanch (not boil) spinach in less water. Since boiling destroys the nutritional content of spinach and the water drained goes a waste. Hence blanch in very less water till spinach turns soft. Sieve besan/chickpea powder in a large bowl, ensuring no lumps are formed. Add little water. 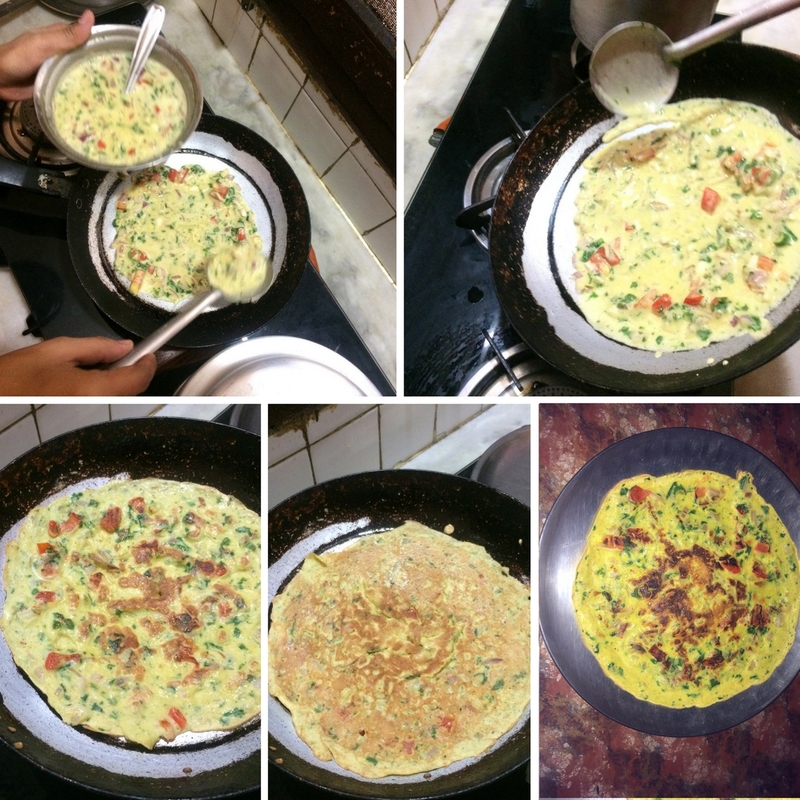 Break eggs and whisk with besan smoothly. 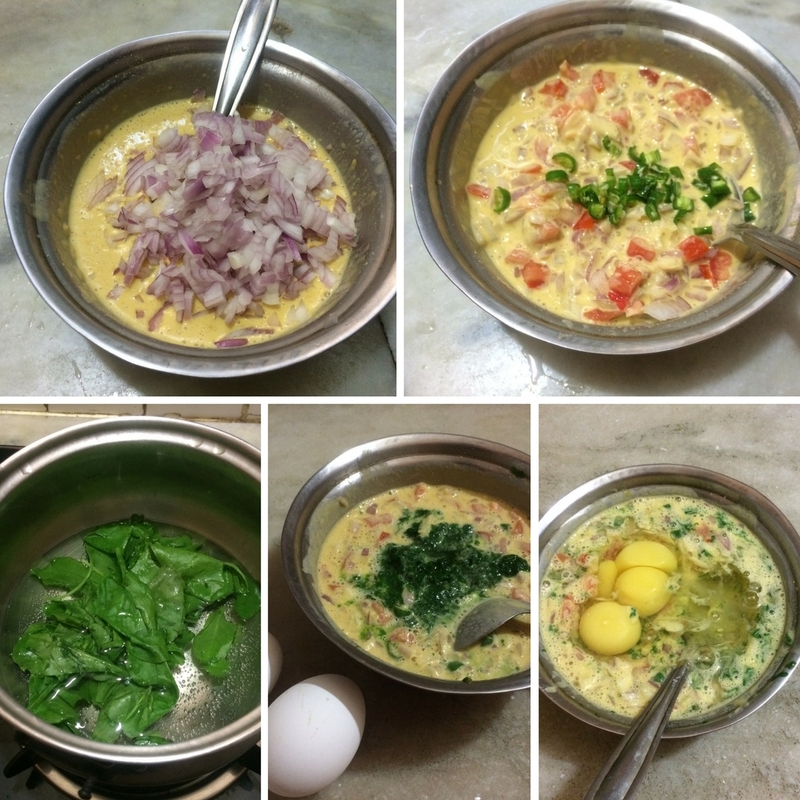 Add chopped onions, tomato, green chilli, pepper, salt, and mashed spinach in the egg-besan mixture. Whisk well. 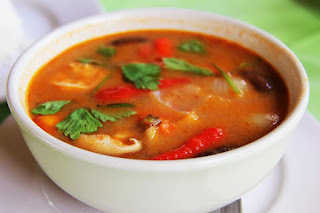 If the mixture turns thick, you can add little water or coconut milk for flowy consistency. Heat oil in a flat pan. Pour the mixture. Spread it evenly and let it cook for 2 minutes. Cover the pan for a minute, allowing the egg to cook. Flip side and cook till both sides turn light brown. Serve hot with mint chutney or ketchup. Tip: Make sure the pan is on low flame. 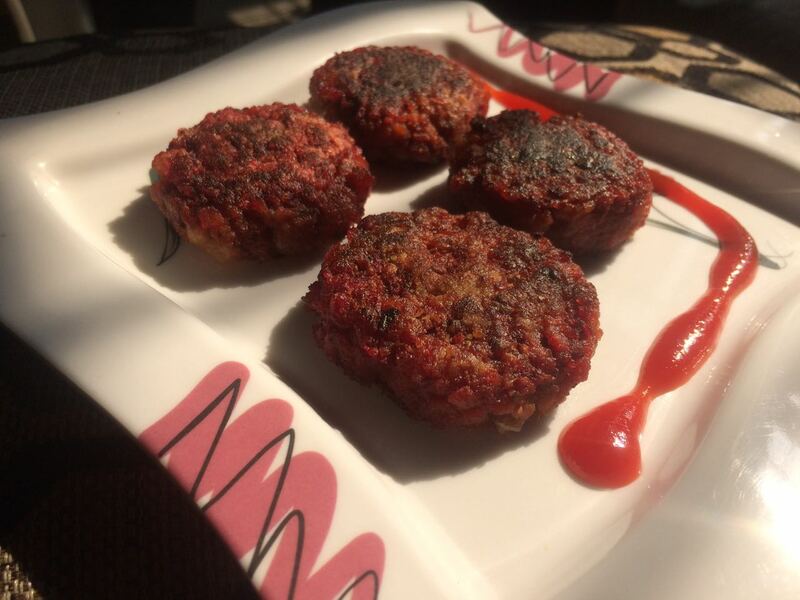 Use non-stick cook ware to avoid sticking of cheela and allowing smooth flipping. 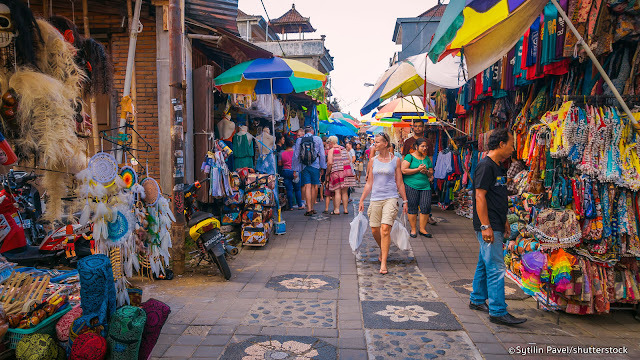 Ubud, the cultural town of Bali is a center for traditional art and tradition. Surrounded with rain forests and rice paddies, the place is a haven for art lovers and nature enthusiasts. 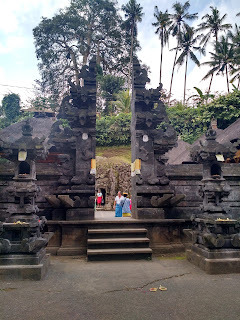 Bali tour is incomplete without visiting Ubud. 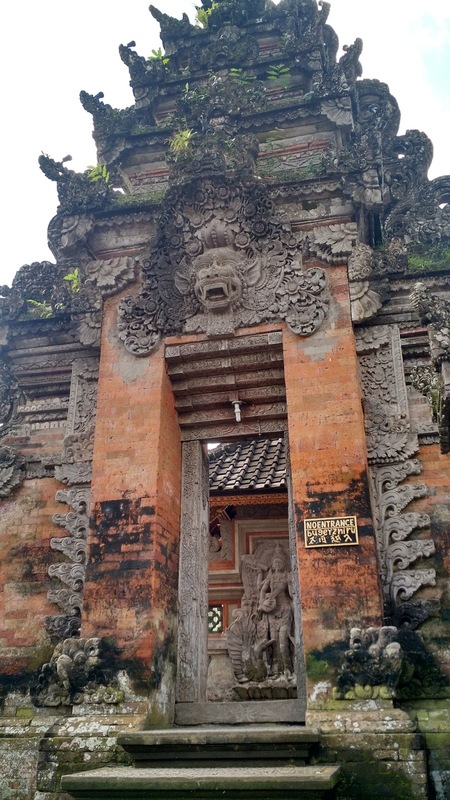 Here are the 5 best things to do and see when you are in Ubud. 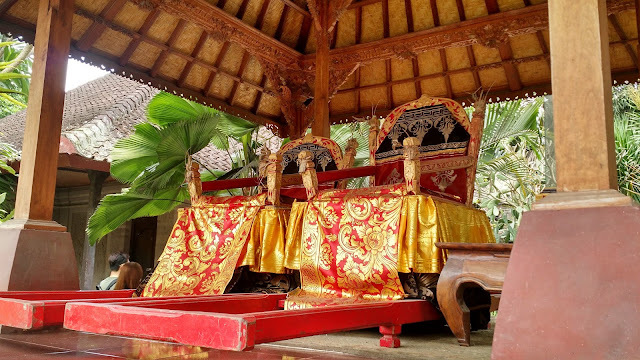 Once the residence of the royal family, Ubud Palace is now a tourist attraction in Bali. The palace showcases the arte facts of the kingdom and spaces which were used for prayer or meetings. Several portions of the place are not accessible to public for religious reasons. The premise has the royal throne on display which is the most noticeable thing. 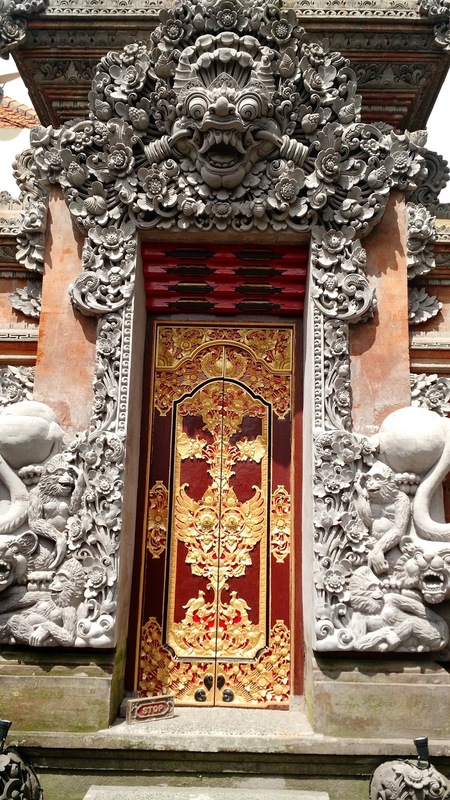 What gets your attention is the intricate carving on the doors. 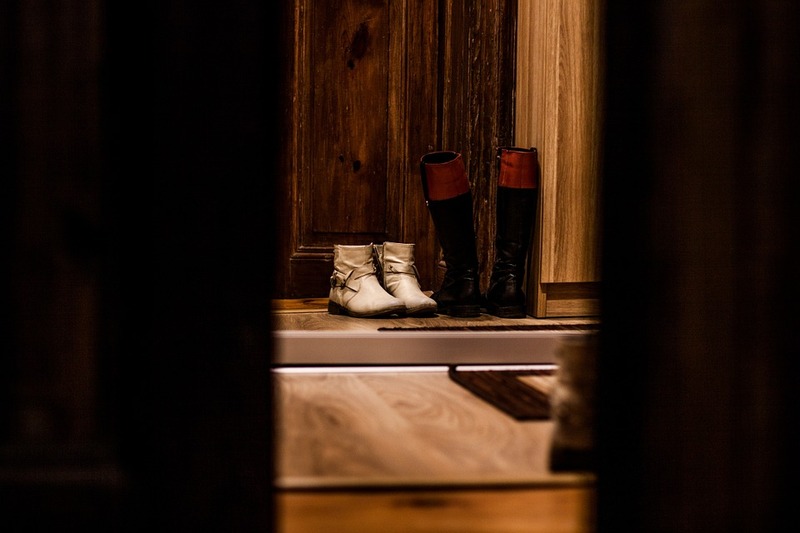 Visitors are not allowed to cross the threshold of the door, leaving you wondering what’s behind those doors? 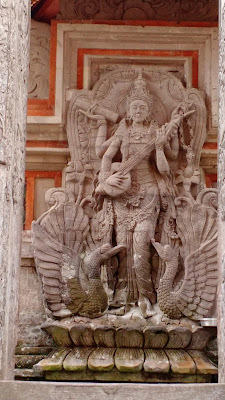 In an opportune moment, one of the doors swung open and revealed a statue of goddess Saraswati . 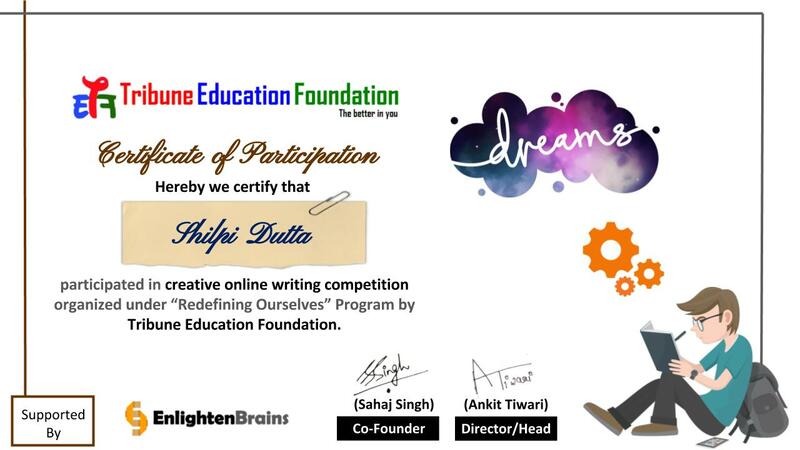 It was truly divine! Dotted with colorful garden and well-built pathways, the Royal Palace lets you peek-a-boo into the glorious relics from the past. Time spent- The place is small, so you can spend thirty minutes at the max here. Parking- You can park your bike in the market. They charge around 2000-3000 IDR. If you are lucky, you may find a free parking spot. 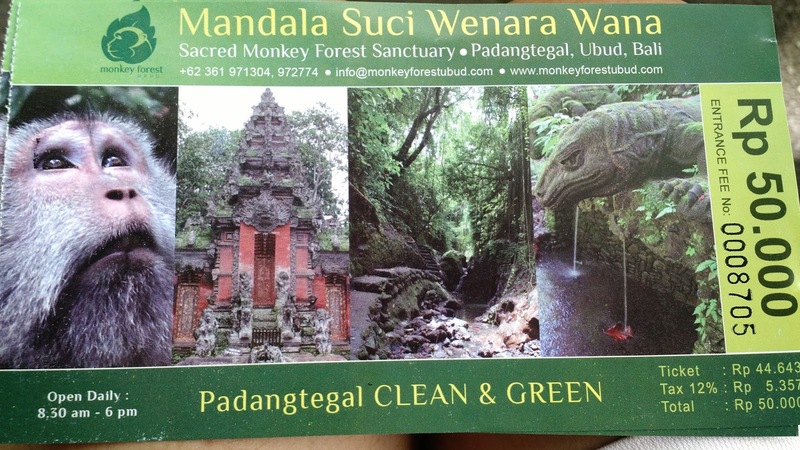 This dense forest dedicated to the monkey god would leave you with deep respect for Indonesian culture. 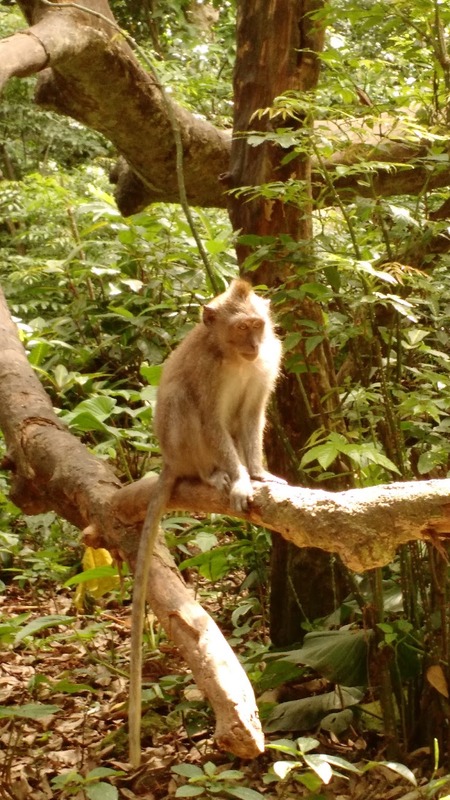 Imagine an entire forest for the monkeys! Inspired from the ancient culture and Ramayana epic, Balinese declared the 12.5 hectares forest land sacred and protected. You not only get to see a large number of primates in the forest but also ancient temples and magnificent structures that marvel you. 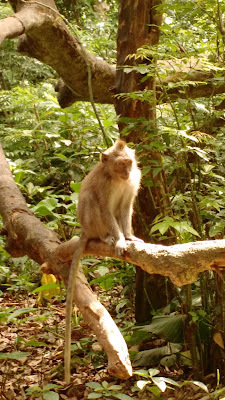 The monkeys are harmless, and friendly most of the times. In case a primate crawls onto your back, give it a banana treat. Should any of these threaten you or turn notorious, the forest guards are there to help you. The lush greenery, lovely architectural structures and huge variety of flora silently make your senses happy. 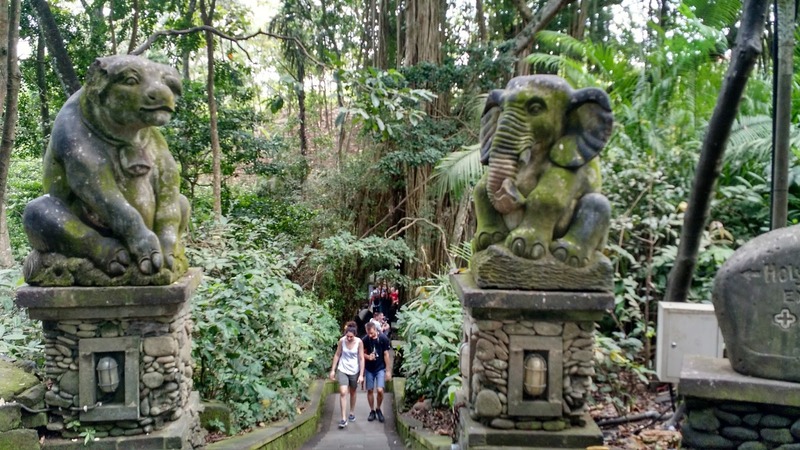 Fill your lungs with oxygen, walk and burn our calories and have fun in the sacred forest in Ubud. Read here is why Monkey Forest a must visit. Time spent-You can cover the huge forest place in 2-3 hours. Parking- You can park your bike in the parking lot for free. Dress code- None. Wear comfy shoes or flats. Avoid heels. 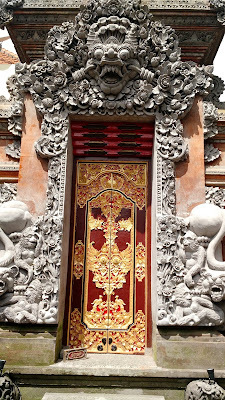 Balinese culture oozes of art and beauty. The colorful market dazzling with Balinese art would surely delight your senses. From old paintings to hand made home décor, the art market is nothing short of a heavenly experience. The rich culture and beautiful tradition embedded in the hearts of the residents’ uplifts your mood, cajoling you to buy something and cherish the memento. Dotted with uptown cafes, restaurants and resorts, the art market would paint a picture of a modern yet peaceful place from somewhere in the lanes of Europe or Goa. Before you reach Ubud, the refreshing rice paddies on the way give you various photo opportunities. 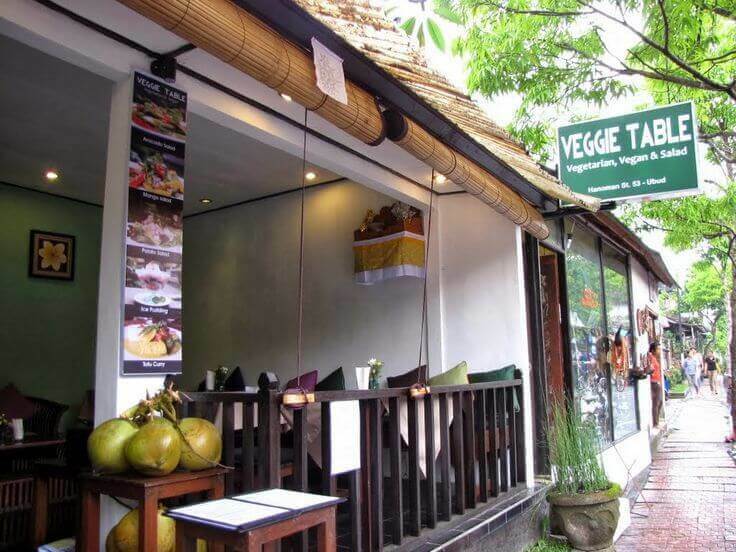 Vegetarian food is so rare to find in Bali, forget about vegan. So, when we passed by Veggie Table, a vegan restaurant with unlimited buffet, it immediately caught our fancy and we dashed in without wasting a single minute. Soft Hindi music greeted our ears, taking us by surprise. The staff told us about the owner's love for Indian culture and his influence on on the cuisine which he curated to cater to Indian taste buds. Do give Veggie Table a try for simple yet delicious and filling vegan lunch. Time spent- You can spend the whole day without restriction. 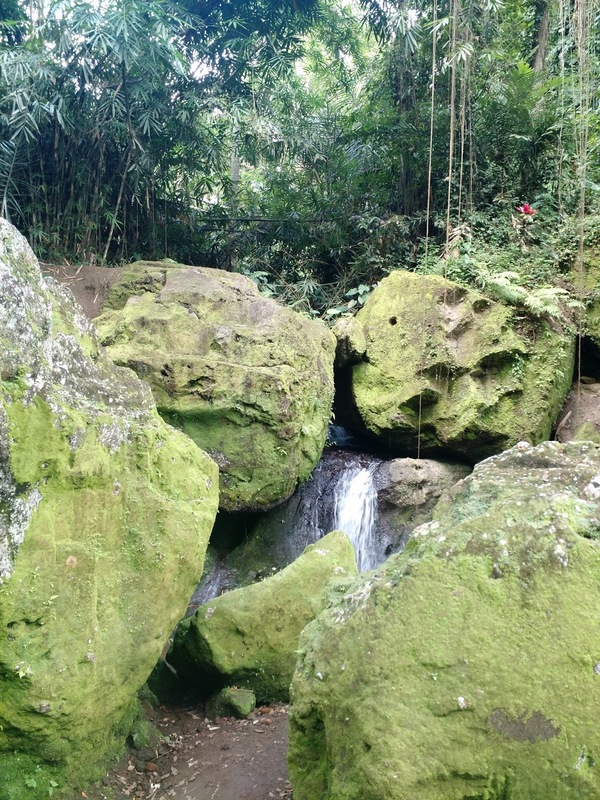 If you are staying in Ubud, there is nothing like it. Parking- 2000-3000 IDR. If you are lucky enough, you can find a free parking spot. Just keep your eyes open. People also call this place “mini monkey forest”. Honestly, both places have no comparison. The star attraction in Goa Gajah is the 9th century elephant cave, housing Ganesha and Shiva idols. The ancient cave temple has dark interiors with simple and bare minimum decoration. 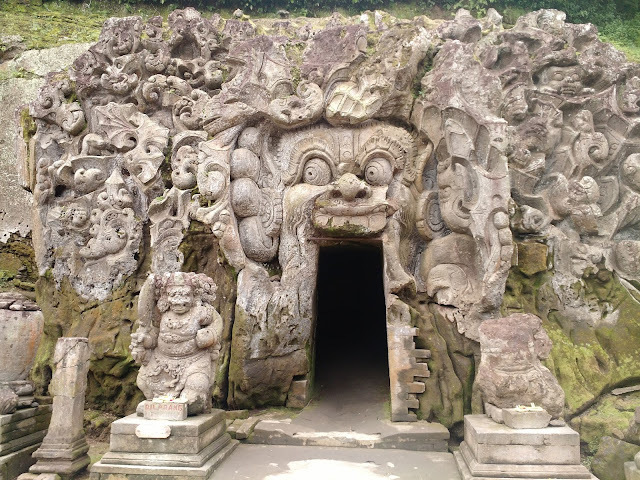 It’s the grand entrance with demon and god carvings that attracts tourists for photos. Often wrongly perceived as a dwelling place for elephants, Goa Gajah made it to the UNESCO world heritage site in the late 90’s. Apart from the cave, the whole area has several small temples, royal thrones, sacred bathing tanks, Buddha temple, beautiful gardens, holy monk cemetery, gorgeous waterfall and tiny art shops. It is a visual treat to be in this place. You cannot afford to wear heels or tight shoes as you need to walk a lot in Goa Gajah. Explore the well maintained site flanked by sacred places throughout the forest and feel at peace. 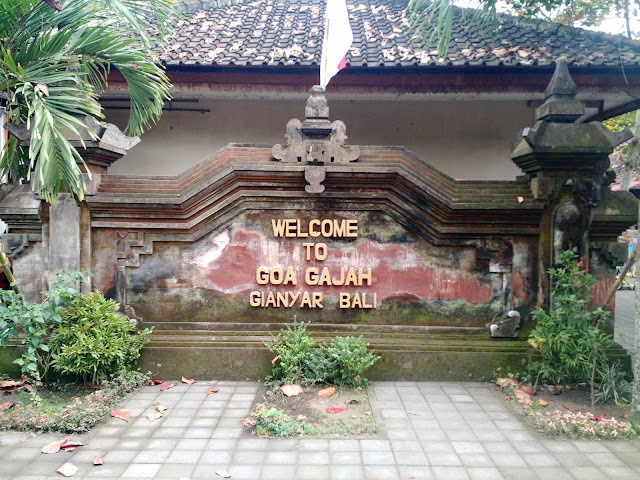 Location- Goa Gajah, Bedulu, Gianyar. 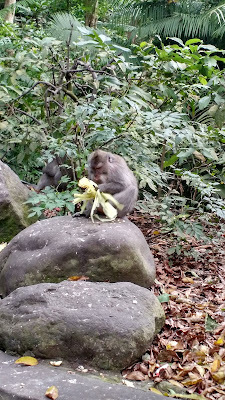 Around 4 km from sacred monkey forest. Dress code- None. A sarong is compulsory if your bare legs show. Sarong is provided at the entry counter. 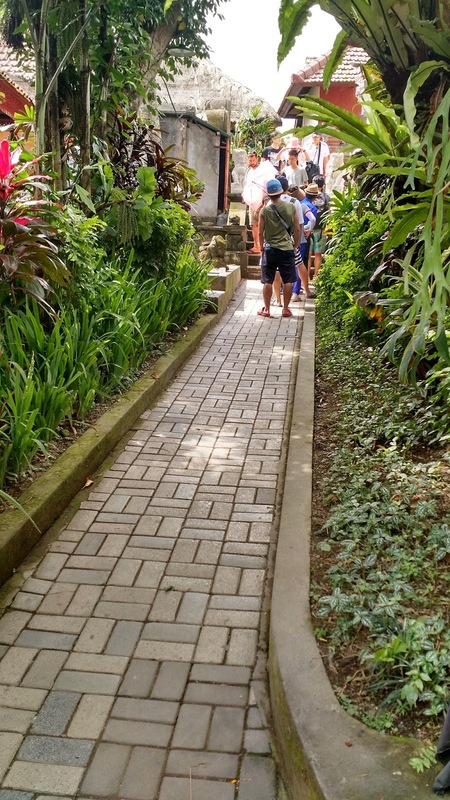 You cannot afford to miss this beautiful water temple in central Ubud. 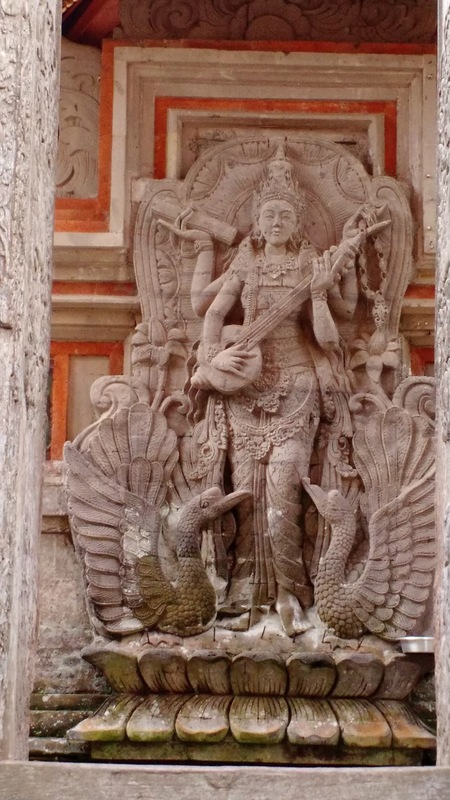 Boasting of lotus filled ponds and classic architecture, Pura Taman Temple is dedicated to the goddess of arts and knowledge, Saraswati. 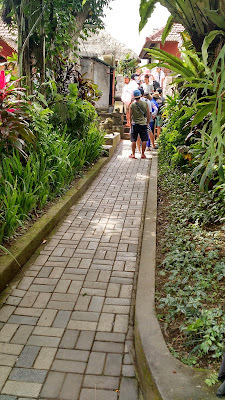 This is great stopover through the town of Ubud. The large premises and amphitheatre gets your attention immediately. From the moment of seeing the temple to entering the site, fills you with a sense of calm and tranquility. At night, the temple is a prevalent location for cultural performances. There are regular dance performances in the evening, except Friday, at cost 80000 IDR. Pura Taman Saraswati Temple is a prominent landmark which you would cross on the way to Monkey Forest in Ubud. The beauty is awe-inspiring. Dress code- Cover your legs with sarong which is given to you at the entrance. With the record of being the most photographed and the most photogenic temple in Bali, Tanah Lot stands tall and firm on the black rocks since the 16th century. 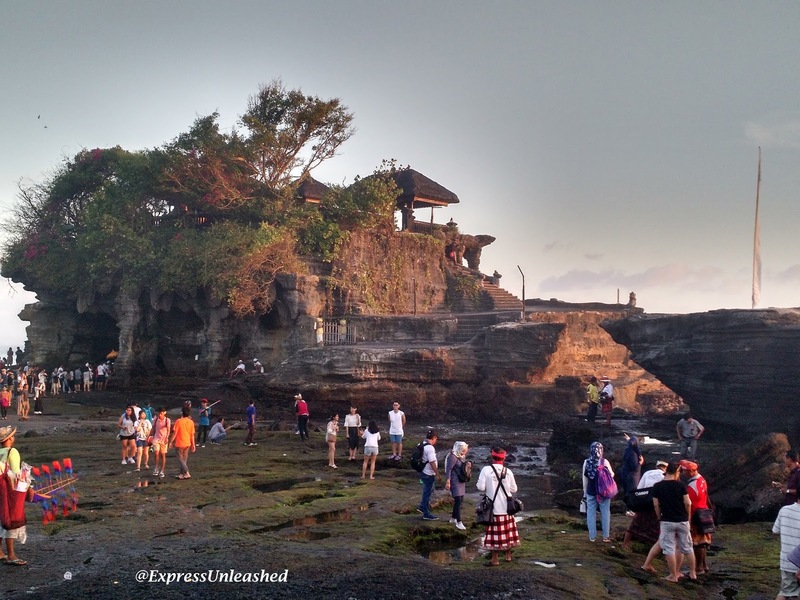 Literally translating into “Land in the sea”, Tanah Lot is said to be a work of Dang Hyang Nirartha, a Hindu traveler and a religious figure in Bali. 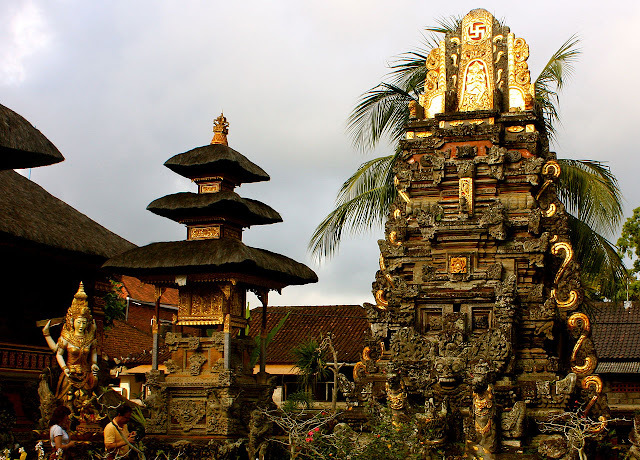 This is one of the seven sea temples around the Balinese coast dedicated to the sea gods. The large offshore rock has been shaped by the sea waves continuously for years. Resulting this, the temple's face rock started to wear out, posing danger to the surrounding and inside potions of Tanah Lot. The Japanese Government in 1980 helped in conservation of the temple and offered an aid of $130 million for its restoration . The exposed areas were restored and parts of the rock temple are artificial installations, unknown to the public. Like all other temples, public entry is restricted inside the temple. Visitors can roam around the temple premises and the temple cave. 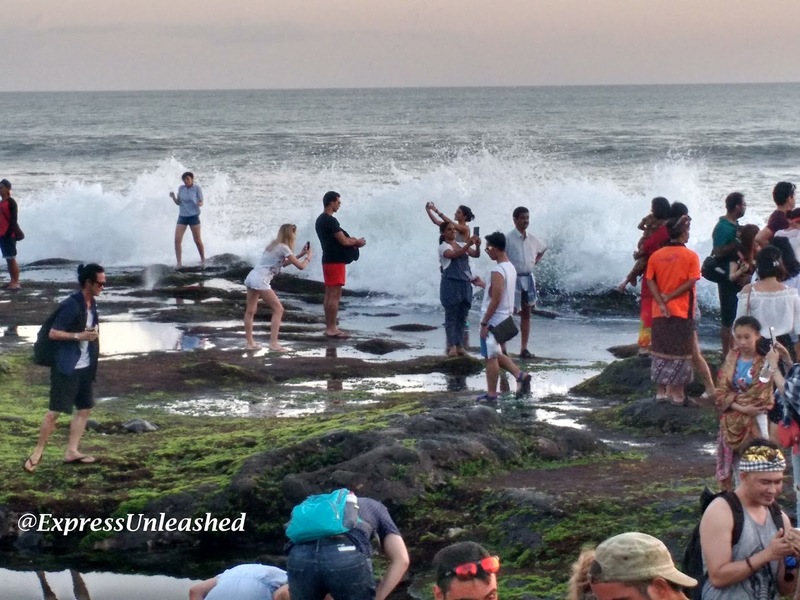 Tanah Lot offers magnificent view of sunset and the surrounding enormous ocean that washes the rocky banks with full might. 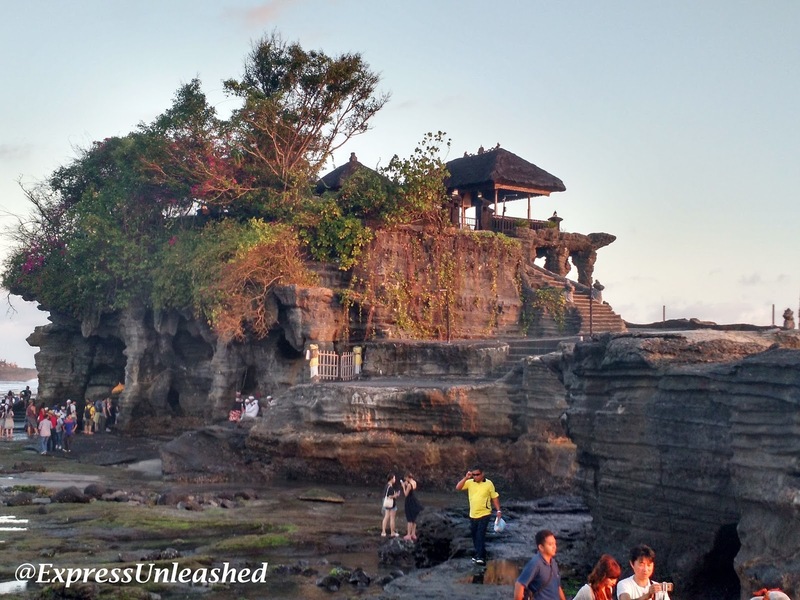 The holy snake housed in the cave at the foot of the temple is said to be guard Tanah Lot from evil spirits. Seeing the snake is said to bring good luck. Well, you can see and touch it by buying a ticket at 50k IDR which they term as"donation". I made it to the Tanah Lot around 5:30 pm, just before sunset. 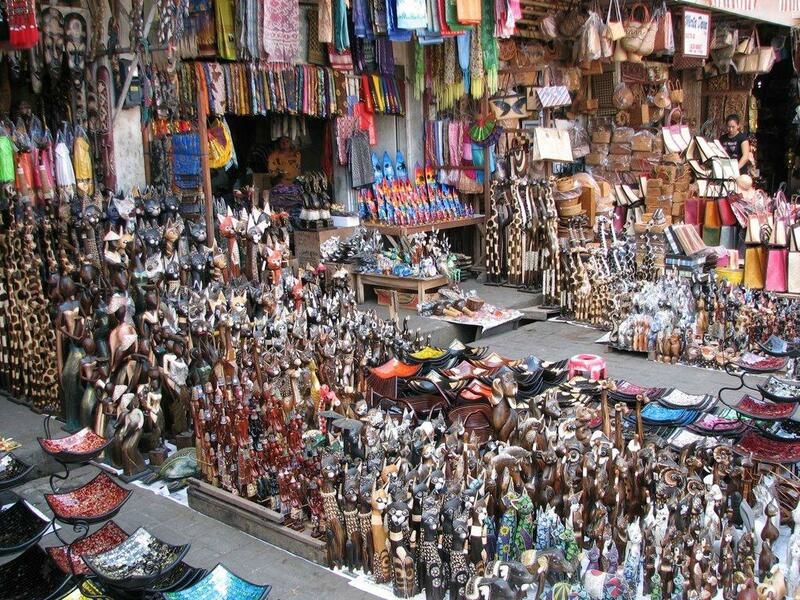 You need to enter through the market place, passing by the colorful souvenir shops. Suddenly the street echoed with soothing music and got crowded with people dressed in traditional attire, carrying a palanquin or paalki. 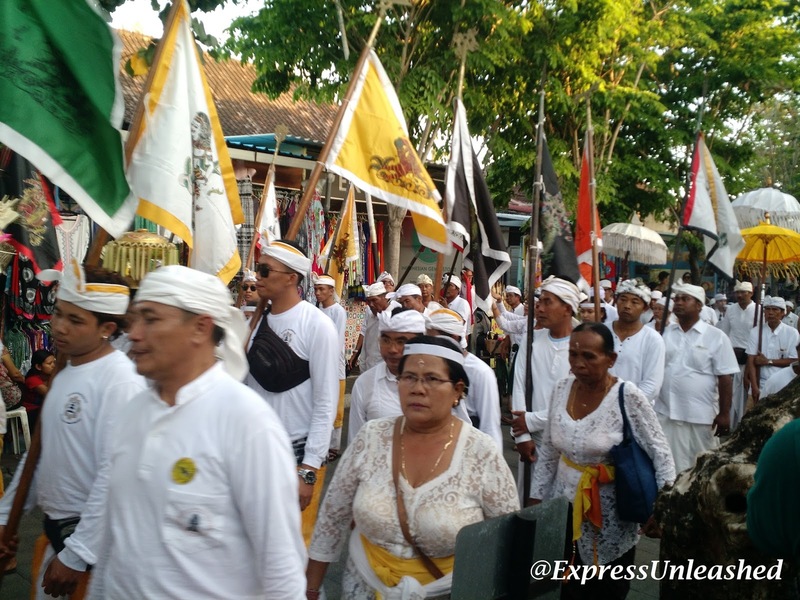 I instantly felt a divine connection while witnessing the procession. The long distance that we traveled and spent lavishly on refilling our scooter's petrol were worth the pain . The gorgeous sunset, the magnificent temple and the traditional procession were visual treats. Post sun down, the market street started to bear a deserted look. We made a pit stop at an eating joint to have an early dinner, since we had famished. My growling tummy gave up and I refused to budge without eating. So much for skipping lunch! Bali is non vegetarian food haven. For the veg eating mortals, noodles is the safest option. We had a wholesome meal at Naty's with veg noodles topped with egg, crispy fries and banana shake. A smiling courteous staff, great food and relaxed ambiance makes Naty's a "must try" in Tanah Lot. With beautiful memories and full appetite, we rode back to our hotel, passing through the rice fields and crowded streets. 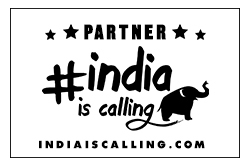 Though wearing a sarong is practiced at the premises, we did not see anybody sport it. Neither we were asked to tie one. I am assuming they ask to do that during the worship/puja time. Advisable- Be dressed in breathable comfortable clothes, since the weather is humid and hot during the day. Carry water with you and be prepared for a long ride to and fro. The roads are literally jam packed in the evening. Be patient, do not honk or shout when stuck in traffic in the narrow lanes. It is a common sight and locals are used to this chaos. All you can do it wait for the traffic to clear. 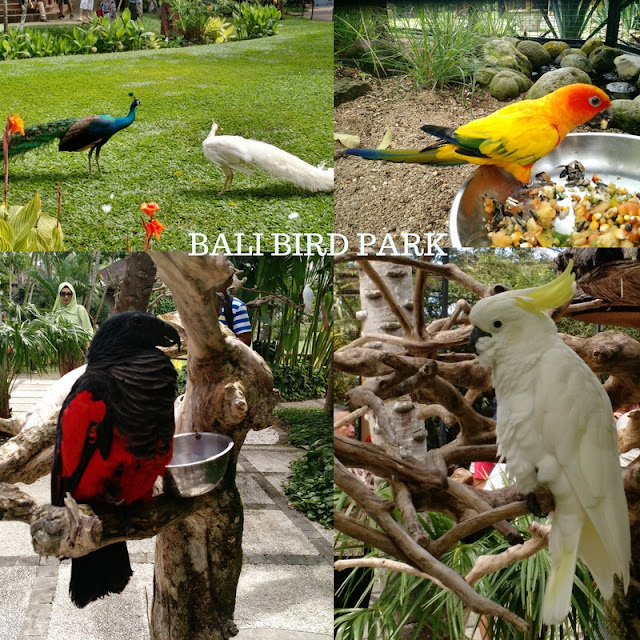 Location- 20 km from Denpasar. To reach- Hire bike /scooter or taxi. Best time to visit- Evening. Reach after 4:30 pm to view the sunset and the religious procession leaving from the temple. Atmos for royal atmosphere, literally! The rising levels of pollution and resulting climate changes have been prime concerns for all since long. 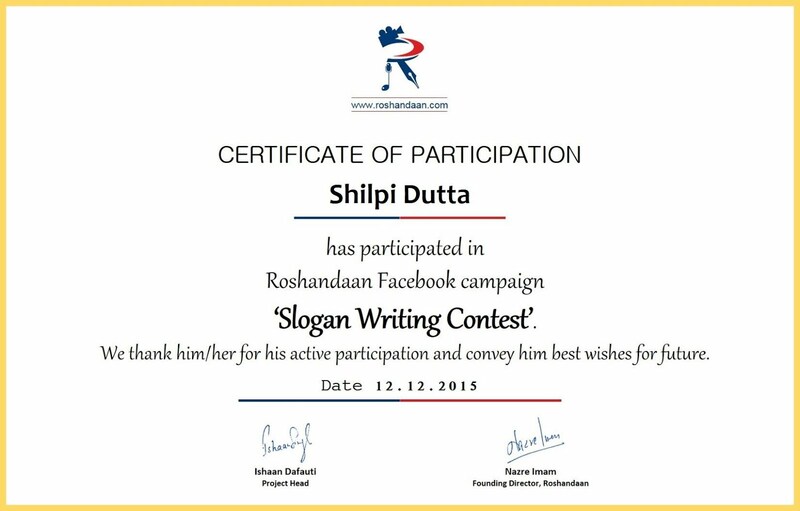 India wasn’t behind in the race towards contributing to the level of daily poison. And then the controversial Odd Even happened (in Delhi) to combat pollution. And then my mind raced to the scented sticks which my mother in law lit up for pooja every day. “Don’t they cause pollution?” I asked myself. Several researches have proved the toxic effect of agarbattis and scented sticks. But who bells the cat, was the question. How dare would I challenge the religious beliefs of my own mom in law. I faked headaches and gradually shifted the agarbatti holder outdoors under the holy basil tree. Though I added toxin to outdoor air, atleast the indoor air would be clean, and I patted my back. 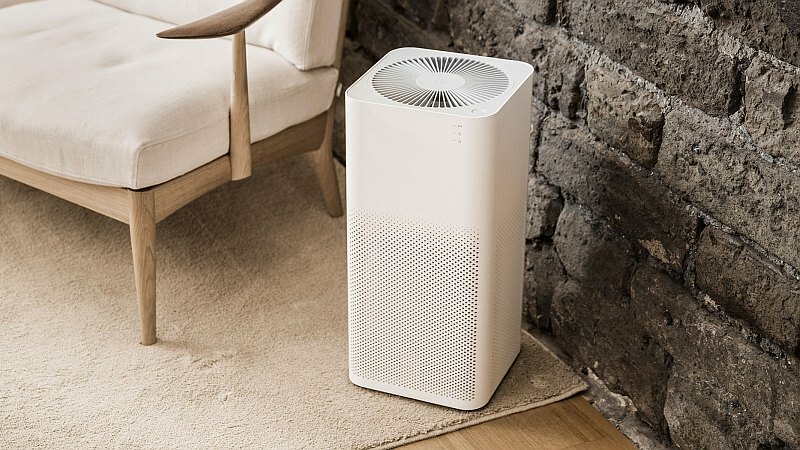 To keep indoor air clean, people have retorted to air-purifiers. Though I find these puny and over hyped, I may want to give it a try. Who knows it might as well just work. 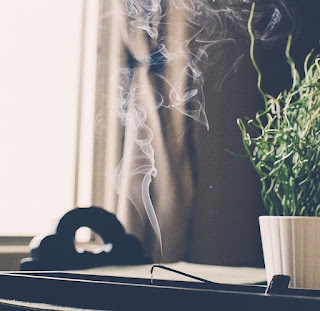 Often unnoticed and under-estimated, the LPG gas in kitchen or freshly painted furniture also releases toxins in the air, strong enough to trigger migraine or breathing trouble. The best possible solution is to check the cylinders for leakage and use paints less toxic pollutants or VOC content. Chemicals in paint have been found to react with forming smog that triggers respiratory disorders. So much for beauty of our homes! Precisely, Royale Atmos is a paint that reduces harmful air pollutants and makes the air cleaner. 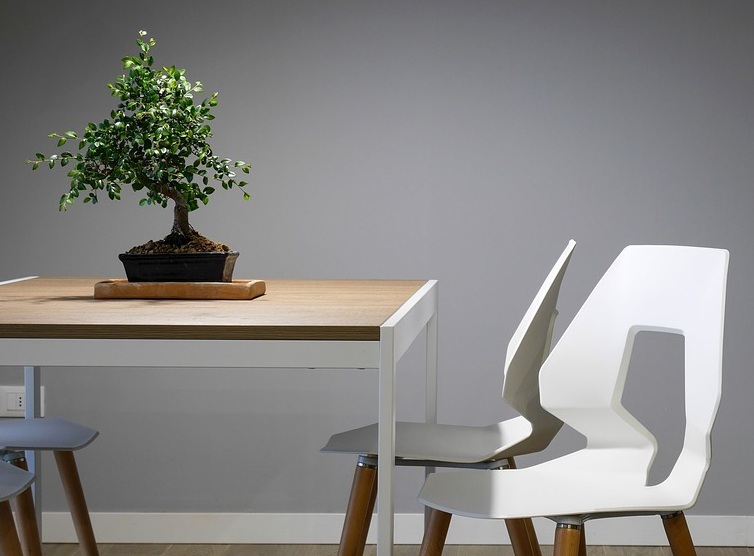 The activated carbon technology absorbs various foul smells & makes the air fresher. Thus, for the first time, Asian Paints presents a paint that not only looks good, but also helps purify air and improve the air quality inside your home. You can even wash your walls before the autumn cleansing ritual without spoiling the paint. Certainly gets brownie points for wash-ability and durability. What’s better than purifying your home in the colors of your own choice! 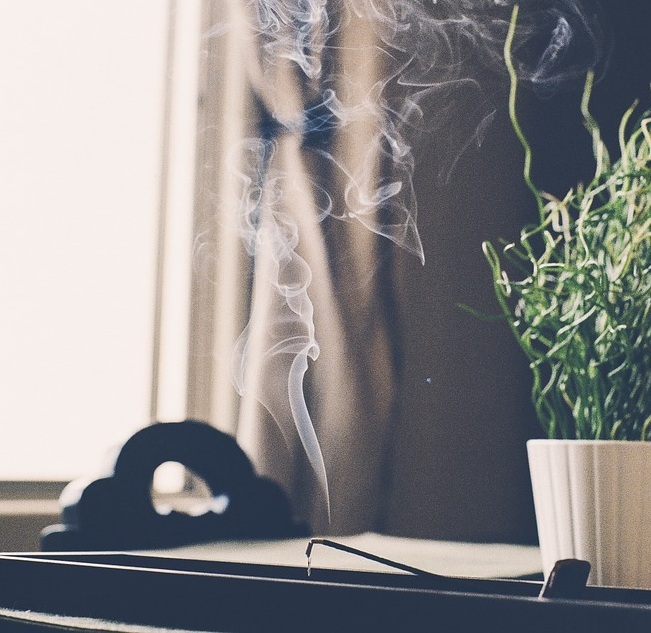 Let’s make a pure choice for clean, fresh and pure indoor air. Let’s make it happen with #RoyaleAtmos. Visit https://www.asianpaints.com/atmos for cleaner details. 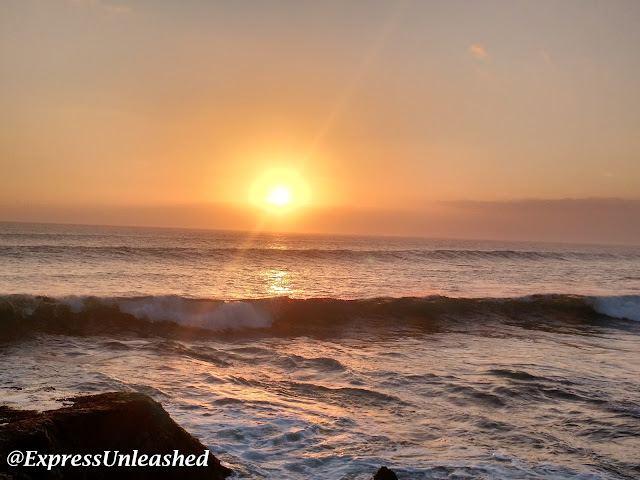 Often food and lifestyle define you and your personality. Eating right and at the right time has been the secret of good health. 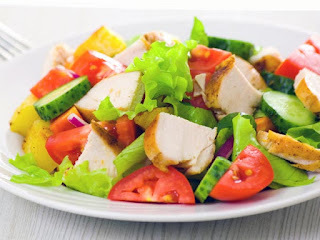 While there are several things you are advised to refrain from post meals, there are various other things you should also refrain from on empty stomach. Surprised? Don’t be. We will tell you what not to do on empty stomach so that you remain in good state of health and avert unwanted consequences. Addiction to bed tea or coffee shot for energy is not new but you need to stop doing that right away. 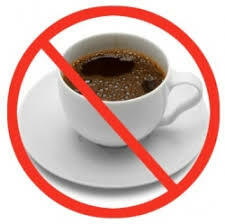 Coffee is high on caffeine which if taken empty stomach causes heartburn and severe digestive problems. Consumed over a longer duration may lead to stomach ulcers, acid reflux or irritable bowel movement. The same goes for tea that erodes the lining of intestines and causes acidity and indigestion. In case you cannot do without your morning beverage, have breakfast along, add creamer to coffee or replace your normal tea with green tea. This piece of advice has been passed on through many generations. Apart from the pills recommended on empty stomach, all others are advised to be consumed only after eating something. 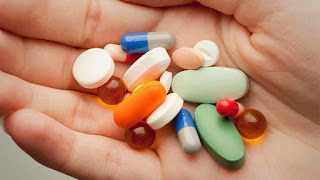 This is because empty stomach lining is exposed to reactions from medicines that cause nausea, constipation, vomiting and intestinal bleeding besides reducing the effect of the medicines. To reduce the negative effects of pills on empty stomach, you can replace water with milk. Spices are good for metabolism but certainly not good until you have something in your tummy. Spices, especially chillies are pungent in nature which trigger indigestion and upset the stomach lining. It is hence important to mix something with spices to avoid such reactions. Perhaps something like bread can be consumed along. Haven’t we all seen people binging while boozing? Well, that’s because alcohol should NEVER be taken if you are empty stomach even if your last meal was three hours ago. 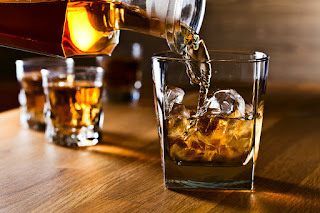 One simple reason behind the same is that alcohol absorption rate in your body will be high and at the same time the breakdown of alcohol will be even slower. This takes a toll on your liver, heart, kidneys and needless to mention, a major hangover that follows. Advisable to eat and layer your stomach before you booze. Hungry body is low on energy and glucose. To replenish it, your body demands food, especially sweets or those high on calories. Since your ability to concentrate and making decisions gets negatively impacted, you end up buying unhealthy food or junk that would instantly satisfy your hunger. Because the need of your stomach gets converted to stress, your brain sends wrong signals to your body leading to an overload of unwanted items in your cart, even in non food stores. The need for those flat abs and toned muscles make you work harder on your body. But have you been working out on empty stomach in morning or evening? That’s all wrong! Your body starts running low on energy during workout and lowers your performance. Also, working out hungry may cause loss of muscle instead of fat. The logic is low glycogen levels which burns muscles if you demand too much from your body while exercising. You hence need to fuel yourself before hitting the gym. Banana or fibrous salads are the most recommended foods before you work out. Ah, we know how a warm glass of lemon and honey in morning has been treated as a mantra to lose belly fat. Little did you all know that lemon will not harm your stomach since it is diluted in water. 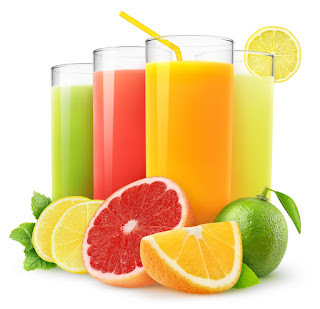 Citrus fruits should be avoided when you haven’t eaten, since fiber and fructose slow down your digestion, irritate stomach and cause acidity. Just like lemon, you can dilute the fruits in water to reduce the acidic level or else totally avoid till you eat something. Did you know that low glucose prevents from us from sleeping and lack of sleep triggers your hunger? Hence the next day you end up hogging more, because of increased hunger hormones. That’s one reason you should never sleep hungry. Secondly, it causes mood swings and stress. Good enough reason for you to not skip meals now? An alternative to eating is consuming milk with honey that keeps you full and helps you sleep better. Can something as simple as chewing gums on empty gut, adversely affect your body? Yes, it can! Always remember, empty stomach is prone to attack on the soft stomach lining. When you chew gums, the digestive juices produced with saliva creates an acidic effect on stomach lining leading to gastritis. 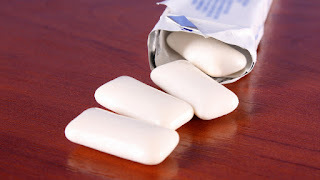 The sweetening effects of gum effects your food habits and leads to addiction of junk, instead of natural healthy food. Hence, it is advisable to chew gums for not more than 10 minutes even if you are full. Yes agreed, one should eat healthy and salads or raw vegetables are good source of vitamins. We know diet conscious ones often do that. We are sorry, you would be surprised that you had been doing that wrong. Consuming raw veggies on empty stomach causes an overload of coarse fiber which causes abdominal pain and accumulation of gas in intestines. We hope the above tips proves to be useful and helps you to be healthy. In a busy and hectic lifestyle, we tend to ignore these little things that eventually harm our body in the long run. All you need is a little bit of precaution and willingness.